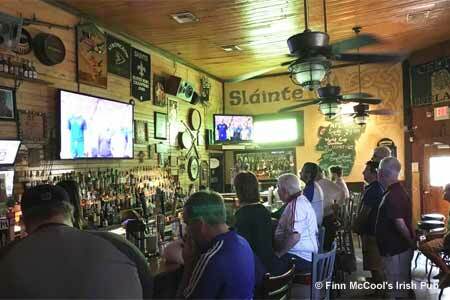 Finn McCool’s is a sports bar disguised as an Irish pub. : New Orleans has a surfeit of sports bars. But if you really want to block out the rest of the world and just party, you need an authentic Irish pub. English and Scottish soccer games play constantly on the 50-inch flat-screen TVs. There’s also trivia nights, a jukebox, frozen Irish coffees and dozens of beer selections. Order food like Irish nachos, fish and chips and sandwiches from the Wolfhound counter.